Memory cards are widely used in various types of devices, from digital camera, tablets, digital photo frame, laptop and many more. If you use computer regularly, chances are you have at least few experiences with copying data to/from a memory card. 1. The speed of the memory card itself. For write speed, there are cards of class 2 to class 10. Class 2 means it has 2MB/s write speed. Modern memory cards have higher read speed. Sandisk Extreme Pro, for example, is rated UHS-II and has read speed up to 280 MB/s. 2. The type of USB connection. USB 3.0 allows faster data transfer than USB 2.0 or below. 3. The bus speed from the USB port to the computer mainboard. 4. The speed of the card reader itself. 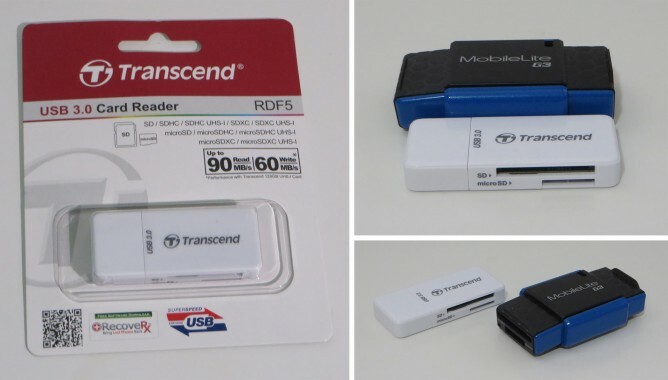 For this article, I am comparing two card readers with USB 3.0 connectors: Kingston MobileLite G3 and Transcend RDF5. I tested them using the same computer (Mac mini 2012) and using the same memory card (Sony SDHC UHS-I 32 GB from my camera). The memory card is rated class 10 (means it should be capable of delivering 10MB/s write speed). It promises to have up to 40 MB/s read speed. In the test, I am using a folder that contains 1,366 photos, with total size of 4GB. Kingston MobileLite G3 has a bulky form factor. Plugging it on laptop’s USB port will probably block adjacent ports. Transcend RDF5 has a slim and lighter design. It won’t block adjacent ports, which was my initial reason considering to get another memory card reader. Kingston does not make any claim about the maximum speed of its card reader, but Transcend claims that RDF5 is capable of delivering up to 90MB/s read speed and up to 60 MB/s write speed. Kingston MobileLite G3 copied the folder (from memory card to computer) within 93 seconds. Right from the start, the data transfer is already high, averaged around 43 MB/s with some up and down from lowest speed of 40.1 MBs to highest speed of 47.9 MB/s. Transcend RDF5 copied the same folder within 93 seconds. It’s a TIE ! However, Transcend card reader started slow at 25 MB/s. It needed few seconds to climb up to 44 MB/s and stayed stable at that point. If the total size of files being copied is smaller, I suspect Kingston card reader will perform better, and vise versa. Kingston MobileLite G3 copied the folder (from computer to memory card) within 7 minutes and 48 seconds. The write speed started around 5 MB/s then increased steadily to 8.8 MB/s near end of transfer. Transcend RDF5 copied the same folder within 11 minutes and 28 seconds. That’s significantly slower. It started around 3 MB/s, going up to 8.1 MB/s then going down again to 4.2 MB/s. Kingston is the clear winner here. Most of my usage of memory card reader is to copy photos from memory card to my computer. So I guess Transcend would do just fine. If I need to copy some large files into memory card, I would need to remember to grab my Kingston MobileLite G3 though.